Preparation time: 20 minutes. Cooking time: 20 minutes. Preheat oven to 400°F. Spray muffin pans (with enough cups for 22 muffins) with nonstick cooking spray. Stir together flours, sugar, baking powder, salt, and pumpkin pie spice. Set aside. In a large mixing bowl, combine the bran cereal and milk and let sit until the cereal softens, about two minutes. Add the egg whites, oil, and pumpkin to the cereal and milk, and blend well. Add the flour mixture, stirring only until it is combined. Portion the batter evenly into the muffin pans. Bake for 20 minutes or until lightly browned and a toothpick inserted into the center comes out clean. 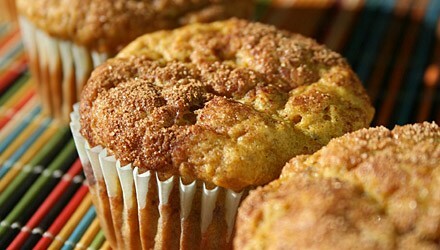 Gently remove muffins from baking pans and serve warm or cold. Serving size: one 2 1/2-inch muffin. This recipe was developed by Sandy Bjerkness, RD, LD, a research dietitian and freelance writer from Rochester, Minnesota.